OUH - What is PSC? ❭ Medical divisions ❭ Surgery, Inflammatory Medicine & Transplantation ❭ Department of Transplantation Medicine ❭ Norwegian PSC Research Center ❭ What is PSC? Primary sclerosing cholangitis (PSC) is a chronic inflammatory disorder of the bile ducts. PSC leads to progressive strings of the bile ducts and eventually to cirrhosis of the liver. PSC is a rare disease, which is more common in Northern Europe, where approximately 1 in 10,000 individuals are affected. There is no effective medical treatment, and PSC is one of the most common indications of liver transplantation in Norway. Affected individuals are typically young (30-40 years old) and have concurrent inflammatory bowel disease (IBD) in 60-80% of the cases. Disease course is highly variable from patient to patient. However, given an average time from diagnosis to liver transplant from 10-15 years, PSC should be considered a serious and important condition. Patients with PSC also have an increased risk of cancer of both the bile ducts (160-1500x) and the large bowel (5x). Primary sclerosing cholangitis (PSC) is a patchwork of different phenotypes in addition to the bile duct affection. Most important are inflammatory bowel disease (IBD), malignancy and other autoimmune diseases. The etiology of PSC is unknown, but the risk of disease is increased in first degree relatives, suggesting that genetic factors are important. 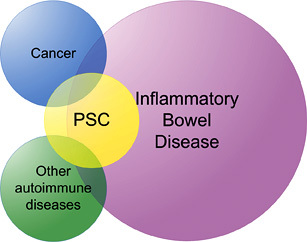 PSC is considered in genetic terminology to be a complex disease, meaning that variation in multiple genes interacting with environmental factors is necessary for disease development. Most consistent is the observation that one or more genetic variations in the so-called human leukocyte antigen (HLA) complex on chromosome 6 contribute to disease risk. Recent studies also point to genetic risk factors outside the HLA complex, which may be related to the activity of inflammatory cells and bile physiology. Smoking is the only environmental factor known to prevent the risk of PSC and appears to protect against disease. Many theories exist about how PSC develops. Two dominant hypotheses are based on the close relationship between PSC and inflammatory bowel disease and point out that (a) bacterial products from the intestine may activate the immunological processes that lead to liver damage, and/or (b) T lymphocytes primarily activated in the intestine may trigger inflammatory processes in the liver, since specific adhesion molecules (receptors on endothelial cells that bind lymphocytes) and characteristic chemokines are expressed both in liver and intestine. PSC is often considered as an autoimmune disease, but no definite proof exists. The HLA association, the presence of autoantibodies and an increased incidence of other autoimmune diseases among the patients represent circumstantial evidence for autoimmunity. The role of bile acids in PSC (e.g. toxic effects) has also not been defined though biliary acids have been shown to be important for the activation of the fibrosis process in animal models. 1. "Primary sclerosing cholangitis - a comprehensive review" by Tom Hemming Karlsen, Trine Folseraas, Douglas Thorburn and Mette Vesterhus (Journal of Hepatology, July 2017).